By his own, modest, admission Norbert Hannig was a Frontflieger, or operational pilot, who really did nothing special during World War Two. He was just, he says, one of the many rank and file pilots fighting for his country and not for the Führer. But his wartime career makes for fascinating and highly informative reading on an aspect of the 1939-45 war not often covered in the English language; primarily that of the campaign against the Soviet Union. 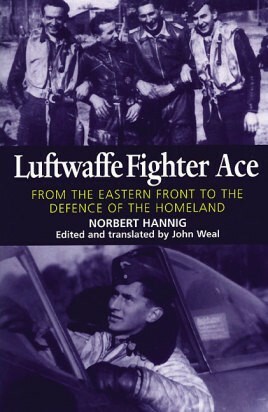 Norbert started flying during high school on gliders and joined the German Air Force as volunteer and officer cadet, one of the midwar-generation of Luftwaffe fighter pilots. He began operations with JG54 on the eastern (Leningrad) front in March 1943; initially he flew Messerschmitt Bf 109s before transitioning to the Focke-Wulf FW 190. After a year’s fighting, he was ordered back to Germany as a flight instructor to oppose the bomber streams of the AAF and RAF. Returning to Russia at the end of 1944, he became a Staffel CO and claimed many aircraft shot down. In April 1945 he converted to the first jet fighter, the Me 262, in south Germany, and flew his last missions with this aircraft. Also serving with JV44 (whose CO was Adolf Galland), Norbert Hannig finished the war with 42 victories from more than 200 missions. Many and varied were his experiences in action against the rejuvenated Soviet Air Force in the east, and the powerful western Allies over the homeland during the final chaotic months of hostilities, which culminated in his captivity. John Weal’s skillful translation ensures that the fluid descriptive style of the author is preserved. Thankfully, also, Norbert was a keen photographer who shot a profusion of images, all previously unpublished, many of which appear in this important book.